Firework and thunder noise phobias and anxieties may cause dogs and cats to tremble, drool and pace. In more serious cases, animals have been known to chew through doors, run through glass windows, and dig under fences to "escape" the noise, only to become lost, picked up by animal control or hit by a car. Loud noises cause very serious problems for noise-sensitive pets. A question not often asked is: What happens if a pet eats a spent firework? Unsurprisingly, fireworks are not meant to be eaten. Guest Author Justine A. Lee DVM DACVEC shares information about firework toxicity and pets. Most fireworks are toxic to pets. 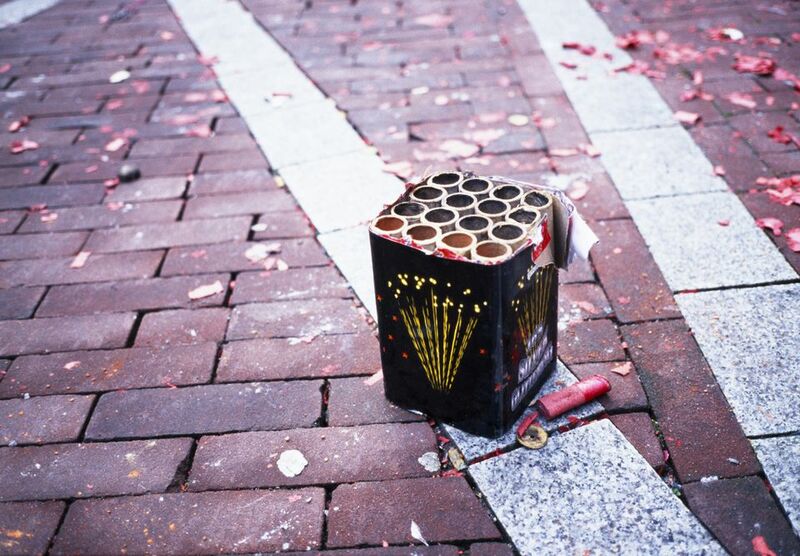 Firecrackers are similar to gunpowder, but they are more dangerous. While gunpowder contains potassium nitrate, carbon, and sulfur, firecrackers contain these ingredients plus additional coloring and explosive agents that are highly toxic. Firecrackers can also contain chlorates which oxidize the red blood cells; blood becomes brown as the iron in the blood’s hemoglobin turns to rust. The rusty blood running through the dog's vessels causes the urine, gums and mucous membranes to turn slightly brown. Rusty blood, called methemoglobinemia, doesn’t carry oxygen which the heart and brain require in order to function. To try to remedy the issue, the spleen begins destroying the damaged red blood cells which are carried to the kidneys but end up plugging the kidney’s filtering mechanism. The result can be kidney failure and death. Most firecrackers also contain charcoal or and coloring agents, which are potentially dangerous heavy metals, including barium, cadmium, and arsenic. When ingested cadmium damages the kidneys, barium hurts the brain and nerves, and arsenic leads to bloody vomiting, bloody diarrhea, and a painful abdomen. The severity of the pet's health issues resulting from ingestion will depend on the type of fireworks and the amount that was eaten. If the fireworks were swallowed within a couple of hours, your vet may suggest giving hydrogen peroxide to induce vomiting. If your pet ate them more than several hours ago, a more holistic vet may recommend a large meal of mashed potatoes, sweet potatoes or pumpkin. These vegetables are easily digested and their bulk may push the gunpowder in fireworks through your dog's system. If your dog celebrated the Fourth of July with a whole holiday's worth of fireworks, home care is not adequate, and that your pet must be hospitalized and treated with IV fluids and medications. Pets ingesting large amounts can suffer tremors or seizures, along with acute kidney failure, bone marrow changes, shallow breathing, and jaundice, which is yellowing of the skin. Exposure to lit fireworks can result in burns to the nose, face, lips or inside of the mouth, as well as eye irritation and conjunctivitis. Firework trash is an annoying problem for many of us. Besides picking up these potentially dangerous pieces of trash, knowing that some pets will seek out and eat spent fireworks is a good heads-up for safety. Keep your pet on a leash, monitor where they are and what they eat to help reduce exposure to this toxic trash. Is Ivermectin Safe for My Pet?